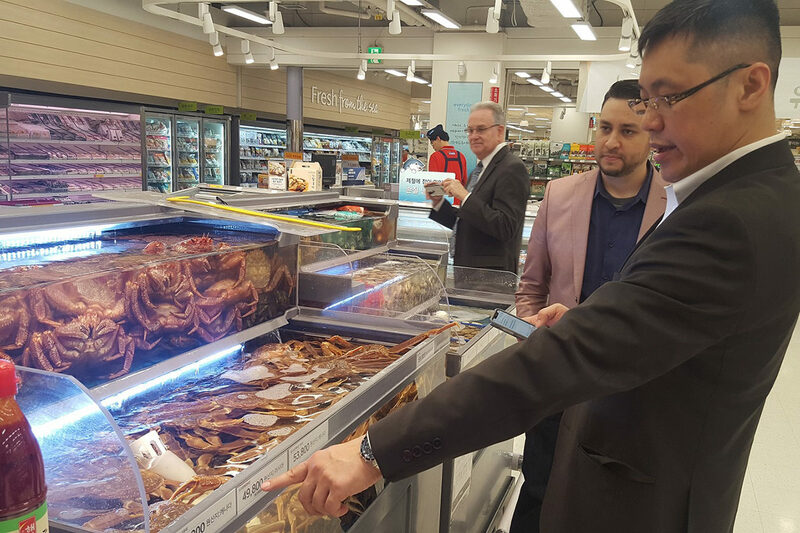 Tony Wen, Tristan Shulman and Vern Jenkins (front to back), look at seafood in Korean grocery. MOSES LAKE, Wash. – A little over a year ago, Tony Wen and his business partner, Tristan Shulman, attended their first workshop on export trade. Today their company, Broadway Morris Trade Company, is up and running, and they are working with Tribal fisheries to supply geoduck to China, Hong Kong and Vietnam; sea urchin to China and Japan; and salmon to Hong Kong and Japan. Planning has already begun to build or acquire a 6,000‑square‑foot facility to process and pack seafood to keep up with export demand, Wen said, and the facility is likely to employ 35 to 50 people. Wen attributes much of their success thus far to that two‑day export workshop in Moses Lake led by Vern Jenkins, the international trade specialist with the Washington Small Business Development Center (SBDC), and Allan Peterson, a business advisor with the SBDC in Moses Lake. The next export readiness workshop is scheduled for 8:30 a.m.–5 p.m. Wednesday–Thursday, Feb. 27–28, at the Columbia Basin Technical Skills Center, 900 E. Yonezawa Blvd., in Moses Lake. The cost is $40. In addition to in‑depth sessions led by Jenkins and Peterson on export business planning, foreign market entry methods and how to get products in front of foreign buyers , the workshop includes presentations and question and answer sessions with shipping and logistics professionals, representatives of the Washington State Department of Agriculture, and a Small Business Administration international loan specialist. The Washington SBDC is a network of nearly 30 business advisors working in communities across the state to provide one‑on‑one advising and training seminars to assist small business owners at every stage of business development. Washington State University is the statewide host of the SBDC and provides administrative support for the program. SBDC services are funded by the SBA, WSU and other institutions of higher education, economic development agencies and business and civic organizations. The workshop is both an entry point for businesses new to export and a boost for those who have already taken the plunge, but are treading water. Wen and Shulman were referred to Jenkins in 2017 when they began talking with lenders about their plan to export surplus heavy equipment to Central America. Both Wen and Shulman own other businesses, so they didn’t foresee export becoming a major focus, but when Jenkins suggested they attend the export readiness workshop, everything changed. He and his partner created the Broadway Morris Trade Company — named for the intersection in New York near the iconic charging bull statue — and began doing market research on a broad range of Washington food products. In spring 2018 they participated in an outbound trade mission to Japan and China organized by the Grant County EDC and the SBDC and further refined their export plan. Jenkins and Peterson have been presenting export readiness workshops in Grant County since 2012. The workshop is co‑hosted by the Grant County Economic Development Council and the Washington SBDC. For more information, see the WSBDC website.